If you are copying a formula across columns, you can use COLUMN() function the same way. Note that you are free to use the result of COLUMN() or ROW() any way you like in the formula. Both functions return a number, so you can apply them in a formula them just like you would use any number.... If I manually enter a formula into a column in an Excel table (i.e. ListObject), AutoCorrect applies this formula to the whole column. Is there any way to control the this behavior via VBA, i.e. can I somehow modify/delete/add this formula? The formula in this column is the trick that allows the remaining formulas to do their job. To my knowledge, this is the only way�without using macros�to write a formula � how to add text boxes in google docs If you are copying a formula across columns, you can use COLUMN() function the same way. Note that you are free to use the result of COLUMN() or ROW() any way you like in the formula. Both functions return a number, so you can apply them in a formula them just like you would use any number. If I manually enter a formula into a column in an Excel table (i.e. ListObject), AutoCorrect applies this formula to the whole column. Is there any way to control the this behavior via VBA, i.e. can I somehow modify/delete/add this formula? If you are copying a formula across columns, you can use COLUMN() function the same way. 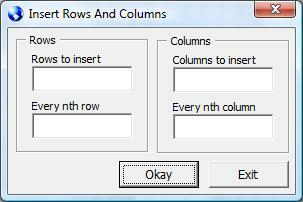 Note that you are free to use the result of COLUMN() or ROW() any way you like in the formula. Both functions return a number, so you can apply them in a formula them just like you would use any number. Hello: I have created an Excel spreadsheet that pulls data from SQL through a T-SQL query that I created and placed in the Excel "Data" menu's "Connections" section.